Click on banner above for more details and to purchase tickets! Reenactors & Living Historians welcome & invited. US Grant first-person impressionist Kenneth Serfass discusses the General’s close relationship with President Abraham Lincoln. Special Guest Speaker Saturday and Sunday: Patrick Schroeder, Head Historian at Appomattox Court House National Park. and to foster and encourage patriotism"
shall not perish from the earth." 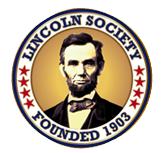 Since 1903, The Lincoln Society in Peekskill has dedicated itself to perpetuating and honoring the memory of Abraham Lincoln, who stopped in Peekskill on February 19, 1861, on the way to his inauguration in Washington DC, with commemorative events, parades and dinners. All rights reserved - No material may be reused without permission. On occasion, the LSP web site links to articles and documents not served from the LSP.ORG domain. The information on these linked web pages is provided by a third party unrelated to LSP. LSP does not control or update this information and is not responsible for the accuracy or completeness of the information on any link. LSP has not completely reviewed and does not endorse any of the third party sites linked to these pages.